Florence + the Machine in concert at Samsung 837. Photo by V.W. FLORENCE + the Machine will always have a special tie to Samsung 837. The British indie rock band has the unique distinction of being the first act to perform at Samsung’s North American flagship space. Incidentally, as of 11:30 a.m. today, Samsung 837 is open to the public. As its name alludes, the three-level, 40,000 square foot glass and steel structure is situated in New York City’s Meatpacking District at 837 Washington Street (at 13th street). Do note that Samsung 837 is not a store. This writer used the S-word last night and was soon apprised of the error of her ways. “It’s not a store, it’s an experience,” General Manager Zach Overton gently corrected. 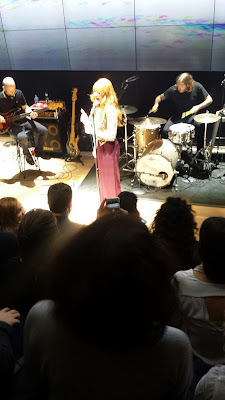 We were seated next to each other during the concert, agreeing at least that Florence Welch reminds us of Stevie Nicks. It really isn’t a store for the simple fact that the staff won’t be directly selling merchandise to the public. All of the Samsung product and devices lounging around the space like felines are for demos only. Of course, there is a strong power of suggestion in all of this syncing and surfing. The Samsung refrigerator does far more than keep food at the approprriate temperature. Photo by V.W. Tech support will eagerly lend a hand to Samsung owners and would-be owners who can’t, for instance, figure out using their current and/or future device how to shoot video vertically, but have it come out horizontally. The amphitheater, which accommodates a three-story screen, will be the venue for various productions, including cooking demos (by the way, there is a full working kitchen in the space), one of its guides gave this reporter to know. Speaking further of kitchen, ensconced in a corner of Samsung 837 adjacent to one of its lounging areas and across from the kitchen, is an as-yet-to-be named smart refrigerator endowed with technology that is simply astonishing. Among its skills-sets: takes photos of what’s inside whenever the door is opened, allowing you, you and you to also see the image on your synced phone - not necessarily a Samsung - while you are standing in line at Trader Joe’s. 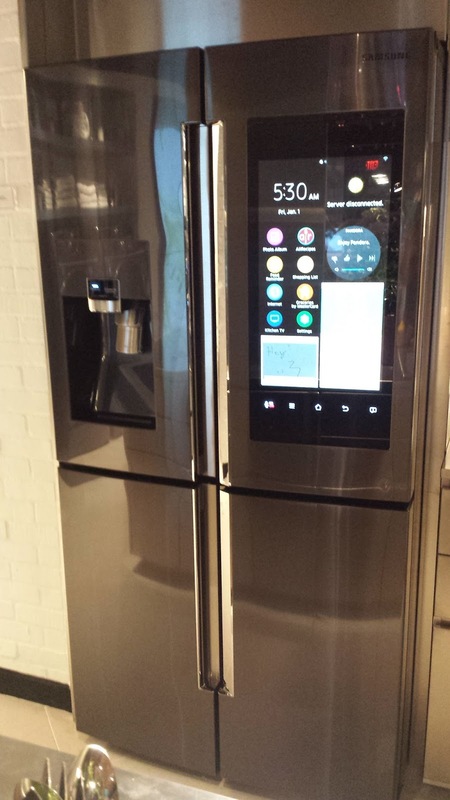 Currently rolling out, the refrigerator is equipped with a notepad on which a shopping list can be made and synced with the phone, also allowing one to see it while standing in the supermarket queue. Sync it with any TV in the house to watch a favorite program in the kitchen. Need the weather? Forget the local meteorologist, just call it up on the refrigerator for a five-day forecast. One can go on and on about this $5,000 wonder. When it was suggested that Samsung should similarly bedazzle a guitar as Florence/Machine drummer Christopher Hayden strapped on one for the next song, ZO leaned in close. “A piano is next,” he smiled. Visit http://www.samsung.com/us/837/?cid=ppc-#!/home to learn more about Samsung 837.